Ideal for any shop or work area. 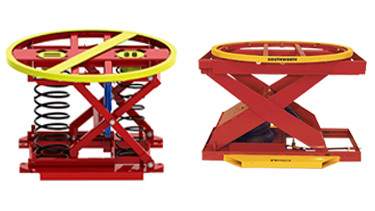 Our product offerings include: scissor lift tables, container tilters, pallet level loaders, pallet trucks, self leveling lift table, pneumatic lift tables, mobile work carts, turntables and other palletizing equipment. We also handle custom coil and roll handling equipment, roll on level loaders, dock lifts, vertical conveyors, portable ergonomic scissor lifts and manual lifter transporters. 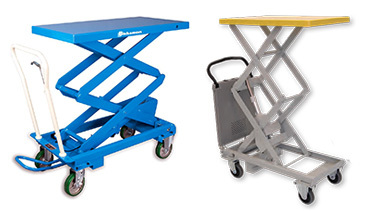 Mobile lift tables, service lifts, and platform tables allow workers to easily move and position loads at a convenient working height. 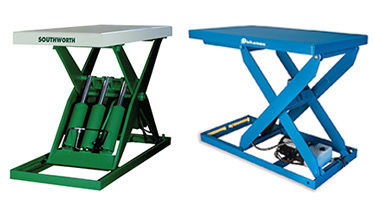 By minimizing undesirable lifting, reaching and stretching, these ergonomic lift tables increase productivity and decrease workplace injuries. Mobile work lifts are used in a wide variety of applications. From stocking shelves in retail stores to lifting and moving materials in libraries, pharmacies, machine shops and industrial manufacturing operations. Ergonomic, height-adjustable workbenches and adjustable height work tables are quickly becoming the standard in industry. If you have an existing table that needs to be converted to a height adjustable table the Dyna-Lift is your answer. 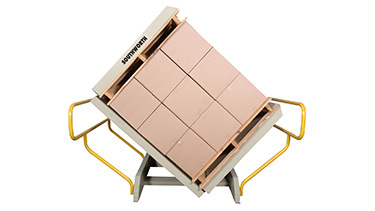 Ergonomic Partners provides Dyna-Lift lifting systems. Adjustable workbenches are available with capabilities ranging anywhere from a few hundred pounds to 1,500 pounds. If you have an existing table that needs to be converted to a height adjustable table the Dyna-Lift is your answer. The PalletPal makes loading and unloading pallets faster, safer and easier. 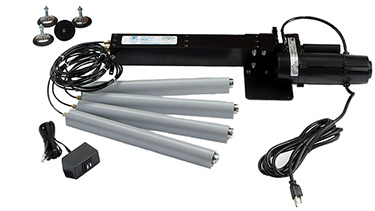 This simple, automatic unit uses a system of springs and shock absorbers to lower and raise loads as boxes are added or removed from pallets. A turntable allows nearside loading and unloading. No power or air supply is required. Pallet loads up to 4,500 pounds can be handled. Ergonomic Partners offers several different designs and styles of height adjustable work benches, industrial workbenches, and mobile work tables. 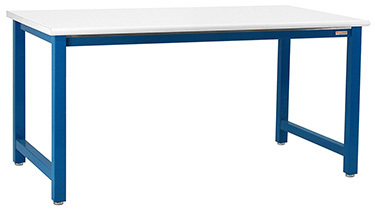 Industrial Workbenches - capacities 5,000 up to 12,000 pounds; available in 1-2 weeks. Light Duty Work Tables - 1,000 pound capacity, several sizes, industrial grade, with solid core tops. Height Adjustable Workbenches - ergonomic comfort and productivity. Modular Workbenches - adjustable aluminum frames, industrial grade, tons of sizes. Ergonomic Partners can help your company with a solution to invert or upend your product. 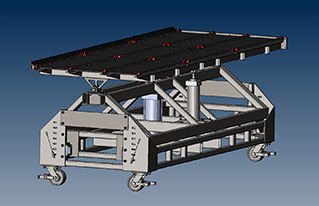 We have standard configurations as well as custom solutions to safely handle your product. Whether you have to turn your product 90 or 180 degrees, or inspect it in several axis we can provide a solution.